Fully maintained lease to include all servicing, maintenance, tyre replacement annual MOT, road tax and wheelchair lift servicing costs and breakdown cover. Based on £780+vat per month over 5 years, with a mileage allowance of 25,000 over the duration of the contract. This Minibus is designed to be able to carry up to 4 wheelchair bound passengers, with a tracked floor and removable seating. It features 9 removable seats and 6 fixed seats and gives the following configurations. It features a PLS Access Lite under carriage wheelchair lift. Available in white or silver and basic or trend model. 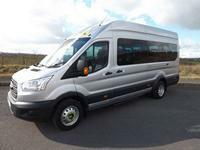 Minibus leasing, long term hire and minibus contract hire options (with or without servicing) are available on this Ford Transit 17 Seat Minibus. TRY BEFORE YOU BUY. This is available to the education, charity, voluntary, care and community transport sectors. Particularly useful for organisations that currently hire taxis or rent minibuses to assist in their decision making process regarding the running costs of a minibus. We offer flexible and affordable leasing options on this minibus with the option to try out the vehicle before you buy it. A minimum rental period of 6 months would normally apply. An additional advance down payment may be required.